As, in most cases, this defect is related to furnace or melt treatment slag it can occur in all casting materials, independent of the molding or casting process. 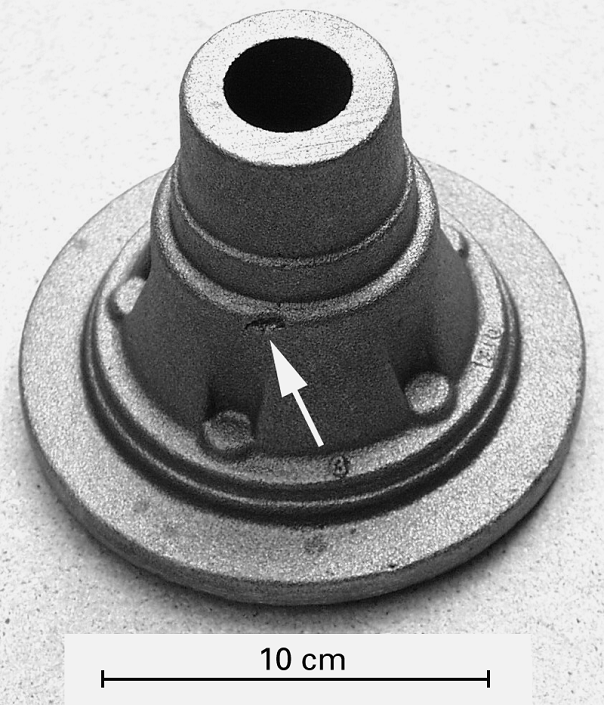 This defect is often observed on casting surfaces on top in the mold, cores, and protruding mold sections. 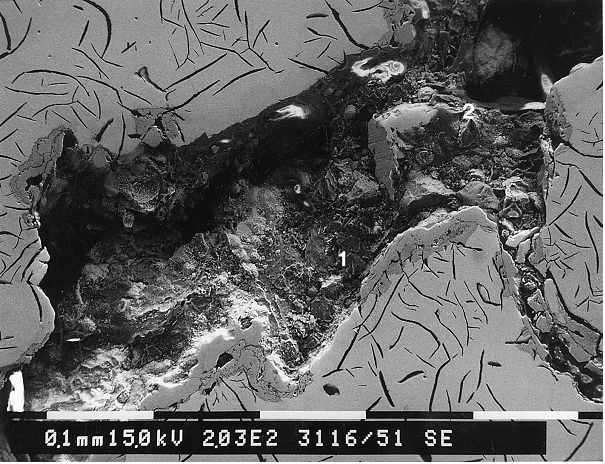 These non-metallic inclusions can be accompanied by gas bubbles. Slag defects are clearly visible to the naked eye on the casting surface or machined part. 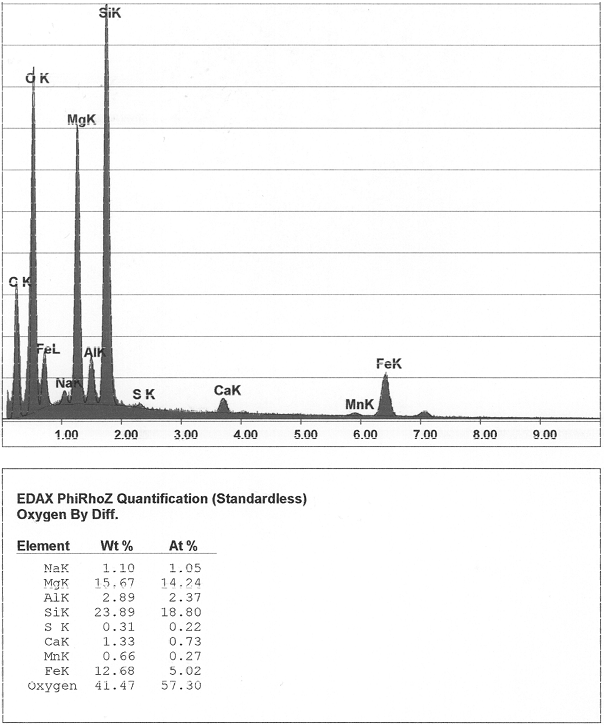 However, clear proof of the actual slag inclusion itself is generally not obtained until inspection of the metallographic specimen, and reliable and unambiguous proof of the slag composition in the defect must be based on an EDX analysis using a scanning electron microscope (Figures 1 and 2). High-viscosity slags mostly occur in the solidified casting structure whereas low-viscosity slags rise much faster to the casting surface where the defect forms after solidification. Slag inclusions have an irregular appearance which reflects their origin and composition (e. g. treatment slags, carbide slags, melt slags). With slag inclusions present on the surface, an irregular, crater-shaped cavity remains after blasting of the castings. Slags can be caused by the molten metal flow, i.e. by melting of non-metallic, oxidic components which were present in the metallic charge or formed by means of oxidation during melting of the metal. In addition, slags can be generated deliberately, namely by adding additives to the metallic charge or the already liquid metal. In both cases,the prerequisite is that the slag itself melts and completes certain metallurgic tasks as a liquid slag cover (slag work). Slag formation is increased at low temperatures and starts earlier in the presence of elements with increased oxygen activity levels (e.g. Al, Mg). The more time the melt has for oxidation, the more slag is produced by the occurring oxides. With decreasing temperatures and in oxidizing atmospheres, mainly due to water vapor, oxidation and thus slag formation may also occur in the mold cavity itself. Moreover, fine materials may be removed from the mold and react with already existing slags. The granular slag that occurs on the bath surface during melting or holding of Al, Mg, and heavy metal alloys due to oxidation with the atmosphere of air or the furnace or reaction with refractory materials is referred to as scum. It forms a heterogeneous mass and must be removed before casting. The liquid slag in cast iron and cast steel forms a homogenous melt layer (slag cover) on the melt. This provides protection, for example, against oxidation from the air or the furnace atmosphere, but it can also contain additional constituents which react with the liquid iron/steel in a deliberate manner, for example, in the sense of an oxidation, desulfurization, dephosphorization, etc. If these slags are partly carried along during casting, slag inclusions occur at casting surfaces on top in the mold, on cores, and protruding mold sections which are often accompanied by bubbles. 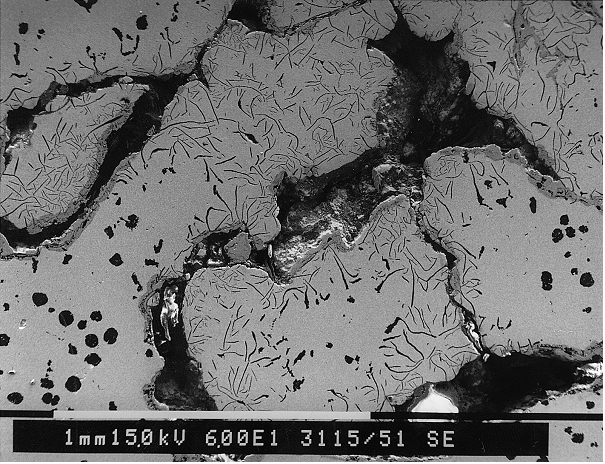 These slag-bubble inclusions caused by metal-slag reactions occur, for example, in iron materials, if carbon monoxide is released following a reaction with manganese-silicone slags with the carbon in the iron and remains entrapped in the solidfying structure in form of gas bubbles. 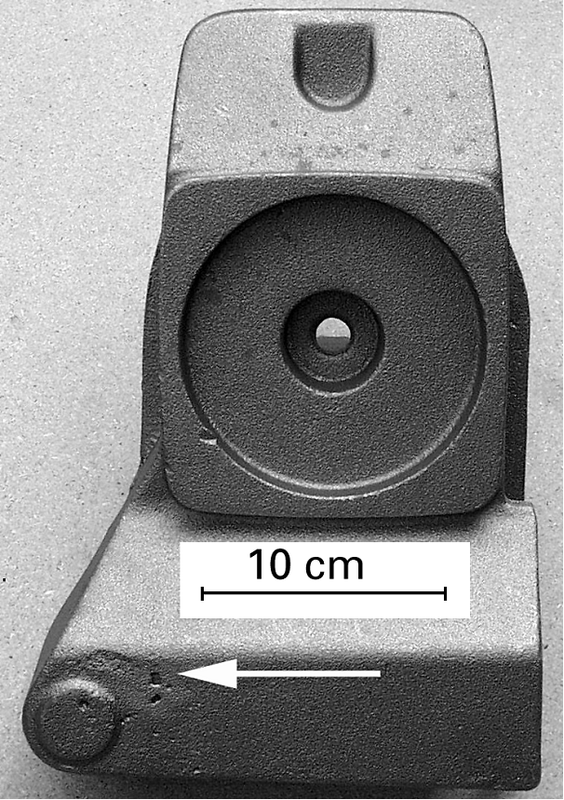 In nodular graphite cast iron, slag inclusions also occur in cases where increased sulfur contents require an increased magnesium addition. The then occurring reaction products such as mangesium sulfide, oxide, and silcone are referred to as dross and can remain in the casting (Figures 3 to 5). In aluminum and magnesium alloys, slag inclusions mainly occur in the form of dross carried along during casting. Reactions between steel melt slags and mold material cannot be entirely avoided, as it is not always possible to prevent slag from being carried along during casting and to suppress slag formation during the casting process. The slags washed into the mold in this way get stuck on undercuts, below cores, and in the cope box wehre they react with the mold material. The dissolution of a mold material by the slag is the more intense, the higher the “mold material requirement” of the slag (unsaturated slag). In practice, unsaturated slags, which also have very low viscosity in most cases, most frequently occur in silicic acid. If such slag comes in contact with a quartz-based mold material, then the latter is dissolved by the slag until the equilibrium i.e. the silicic acid saturation, has been reached. Al2O3, CaO, Cr2O3, K2O, Na2O, and TiO2 in the slag promote the dissolution of the quartz sand, as they significantly extend the region of the unsaturated silicic acid slags. 1. Clean, thorough way of working. fluxing agents for separation of metal from the dross and/or slag from iron. Dry casting ladles, casting tools etc. 4. Use teapot spout ladles, increase the casting temperature and reduce the casting time. 5. Ensure that pouring basins are always full. 6. Use casting filters, especially with aluminum alloys and nodular graphite cast iron. 7. Avoid turbulencdes during casting, especially with aluminum and magensium alloys. 8. Special design of the runner to ensure that slag or dross is retained (slag skimmer). This can be realized, for example, by means of an extension of the runner beyond the gates; this so-called dead runner collects the material flowing in first which usually has the highest level of slag contamination. Another design element is the so-called saw tooth runner where the slag is collected in the tooth tips.